Heat oven to 350°F. Spray bottom and sides of 8x4-inch loaf pan with cooking spray; lightly flour. In small bowl, beat all ingredients except chocolate syrup, 1/4 teaspoon cinnamon and the ice cream with electric mixer on low speed 30 seconds, scraping bowl frequently. Beat on medium speed 3 minutes, scraping bowl occasionally. Pour into pan. Bake 30 to 35 minutes or until toothpick inserted in center comes out clean. Before serving cake, in small microwavable bowl, stir chocolate syrup and 1/4 teaspoon cinnamon. Microwave on High 1 minute; stir. 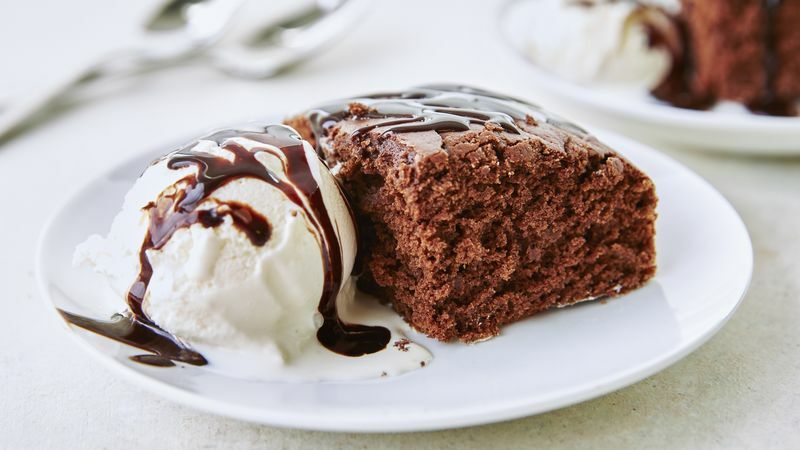 Drizzle warm sauce over warm or cool cake. Serve with ice cream. For the kid at heart, serve this yummy dessert in a sundae bowl, and top it off with a maraschino cherry.